For 33 years we have been providing the highest quality plants, trees and shrubs. Our extensive selection includes perennials, annuals, bedding plants, fertilizers, soils, & mediums. We also carry a large selection of pottery, statues and decorative items. In addition, we have a full service feed and tack store with all of the items needed for your feathered and four legged friends. 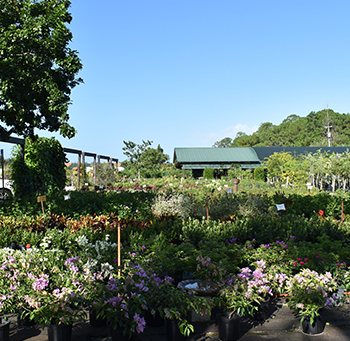 Stop by and see our 10-acre nursery and experience full service and a knowledgeable staff. Golden Gate Nursery was founded upon a dedication to old-fashioned service and the belief that the customer always comes first. Golden Gate Nursery is committed to meeting the specific needs of our patrons by offering distinctive, high-quality items to accentuate and enhance the home, patio, and garden. We offer a wide variety of Florida friendly flowering plants to choose from. We offer a wide variety of palm trees to choose from. We offer a wide variety of Citrus & Tropical Fruit trees to choose from. We offer a wide variety of feeds, hay, supplies and fencing. We offer a wide variety of pet supplies to choose from. We offer a wide variety of pottery and garden art to choose from. All landscape designs begin with what you envision. We bring your ideas to reality by sharing our experience and working with your preferences, to develop a design that showcases your property for years to come. From the right fertilizer to use, to using the right Florida friendly plants, to proper pest control our staff is here to guide you to the perfect garden or ornamental sanctuary. Your yard is something to be proud of and enjoy year-round! We carry only the best landscaping supplies. From animal friendly herbicides to mulch to everything in between to maintain your Landscaping, Flower Garden, Butterfly Garden or Vegetable Garden. With the use of Florida friendly plants and yard art or fountains you can develop a low maintenance garden that will give enjoyment for years to come. We will help you choose the right plants, trees and yard art accents for your landscape design. For years landscapers and developers in the Naples area have been choosing us to supply them with healthiest plants, trees and sod. Stop in today and start your commercial account.